Flight is a sculpture rendered in welded steel with a rust patina. “Flight” is composed of two wings each having a distinctive camber and taper and connoting duality but joined together. In “Flight” the whole yields something greater than the sum of its parts, opening doors of possibility, discovery, and creativity. The lyrical opening between the two wings allows the viewer to look skyward inviting our own spirits to seek flight. The sculpture rests on a curved base anchored in earth and then steps up to a smaller square. 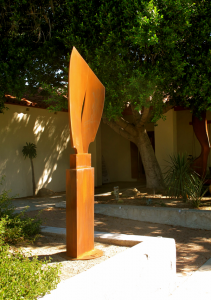 Ultimately, there is a small base of the sculpture that bursts into a larger upward sweep toward a singular high point that attempts to represent oneness or bliss.